When it comes to the United States, it is mostly understood that Native Americans were here first. Before it was recorded by the likes of Elvis, Barbara Streisand and Cher, Until It’s Time for You to Go was recorded first by a Native American: Buffy Sainte-Marie. Cree singer-songwriter, Buffy Sainte-Marie, was breaking ground in the 1960s while the rest of the North American counter-culture was just beginning to wake up. According to her website, the start of Sainte-Marie’s career put her in a unique place “after the beatniks and before the hippies.” Touring colleges, reservations and concert halls throughout the 1960s, Sainte-Marie won acclaim but also undoubtedly shattered audience expectations of Native Americans. She was probably the first Native American many people experienced apart from television or film. 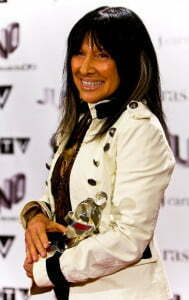 Even after being blacklisted by the Lyndon B. Johnson Administration, Buffy Sainte-Marie continued to gain fame internationally. She could be seen supporting grassroots and activist causes like the American Indian Movement, all the while winning an Academy Award and Golden Globe for her song, Up Where We Belong. It was 1969 when Buffy focused her activist passion into education. Establishing the Nihewan Foundation for Native American Education, her aim was to raise self-identify and self-esteem in generations of Indian children by integrating accurate, enriching information about Native cultures into their learning. Though the Foundation and her Cradleboard project, Buffy also provides cross-cultural training among students and teachers internationally to promote an understanding of Native cultures. Two of the students Buffy sponsored went on to become tribal college presidents who are helping other students reach their full potential. By 1975, her passion spilled over into a five-year run on Sesame Street. Over the course of her 52-year career, Buffy has earned and continues to earn numerous awards for music, education and the arts. Yet, at the forefront of all this was creating opportunity and improving recognition for Native Americans – a passion that earned her a Lifetime Achievement Award from the American Indian College Fund. Like Buffy, our American Indian Education Foundation (AIEF) shares a commitment to education and strives to create opportunity for Native youth. We believe that education is a key to the long-term challenges facing Indian country. In addition to providing scholarships for undergraduate and graduate students attending universities, tribal colleges, and vocational or technical schools, AIEF partners with Native-serving schools to support retention. Only about 20% of Native Americans who start college complete their first year, but through these partnerships, 95% of AIEF scholarship students complete freshmen year. On this day and in thinking about Native Americans giving back, we would like to recognize Buffy Sainte-Marie for enriching the lives of Native Americans through education and non-Natives through cultural education. Her work supports not only Native American youth but also tribal futures, as well as AIEF students, partners and donors, and all who care about education. “Native Americans Giving Back” is a blog series that features Native American celebrities who are giving back to Indian country and supporting the same types of causes NRC supports. The series will run periodically through year-end 2014 and feature topics from all of NRC’s regular blog writers. This entry was posted in Humanitarian and tagged Academy Award, American Indian, American Indian College Fund, American Indian Education Foundation, American Indian Movement, Buffy Sainte-Marie, Cradleboard, Golden Globe, National Relief Charities, Native American, Nihewan Foundation, scholarships, Sesame Street. Bookmark the permalink. Trackbacks are closed, but you can post a comment.